Put the cubed parsnips on the baking sheet. Drizzle with 2 tablespoons of olive oil. Use your hands to toss the vegetables to coat with the olive oil; season with salt and pepper. Spread the parsnips in an even layer and bake for 25 minutes, or until tender. Remove from the oven and set aside. In a large skillet, cook the diced bacon until brown and crisp; transfer to a paper-towel lined plate and set aside. Leave about 1 tablespoon of bacon grease in the skillet; remove any excess. Cook the pasta in boiling salted water until al dente; drain. Add the sliced leeks to the skillet over medium heat, saute, stirring frequently for about 5 minutes. Stir in the cream and bacon; simmer for 2-3 minutes. 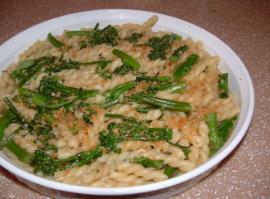 Stir in the cooked pasta, the roasted parsnips, Parmesan cheese and parsley. Season with salt and lots of black pepper. Transfer to a serving bowl and drizzle with olive oil before serving. The parsnip is a root vegetable closely related to the carrot and parsley. Parsnips actually look like white carrots, usually a shade of pale yellow, ivory or off-white. But as sweet as the carrot is, the parsnip is even sweeter. In fact, a frost will intensify its sugar content and residual sweetness. There are a number of different ways to cook parsnips. You can prepare as you would for mashed potatoes. Simply dice and boil them, and then mash or puree them with milk, butter, salt and pepper for a delicious side dish. Baking: Slice a parsnip into fries, and then bake them for a healthy alternative to French fries. Roasting: Sliced roasted parsnips and carrots make for a great side dish to meat-based dishes. Frying: Chop a parsnip into cubes and fry them in coconut oil to make a healthy hash brown. Add to your soup: Blend a parsnip with other vegetables and spices to make a hearty, nutritious soup. Roasted parsnips add a subtle sweetness to this comforting pasta dish combined with crisp bacon and tender leeks in a creamy sauce.